MOBILE – With the news breaking Monday that Alabama’s entire congressional delegation supports the proposed modernization and expansion – including major deepening and widening – of the Port of Mobile, I am once again left in awe at what the Port – and its success – means for the entire state. It was a surprisingly cool summer day when I visited the Port in August, a steady breeze off the water making the normally blanket-like heat quite bearable. I was there on a tour organized by the Alabama Coal Association, with its President Patrick Cagle leading the charge. We all shuttled in on a small transit bus, like you would find at a hotel, to the McDuffie Coal Terminal and proceeded into a small metal-sided office building for a quick briefing from the Port’s Deputy Director, Smitty Thorne, who is a longtime public servant set to retire in February. I went into their conference room thinking I knew how important the Port was to the state and that the coal industry played a large role in that, but the facts and figures that the Port staff shared were staggering nonetheless. First, let me just get this out of the way – the Port does not take a dime from the state budget, i.e. the General Fund. It is completely self-sufficient, generating around $160 million in annual revenue that is pumped back into continual improvements of the Port. And the continual improvement is paying off – Alabama’s Port is the fastest growing container port in North America, at a 20 percent growth rate this year. It is now the 10th largest port between the U.S., Canada and Mexico and the second and third largest steel and coal ports respectively. The Port of Mobile also finds itself a major mover of automotive parts and breakbulk forest products. They are constantly innovating, too. We are talking real-time tracking of individual slabs of steel with RFID chips, with them handling 3.3 million tons of slabs annually; a state-of-the-art “AutoMobile International” roll-on/roll-off (Ro/Ro) facility that will boost automotive exports considerably when it is completed in late 2019 or early 2020; a world-class transportation network to and from the Port, including five national (Class 1) railroads, three short line railroads and easy access to both I-65 and I-10; and now the proposed plan for deepening and widening. The Port handled a massive number of vessels in fiscal year 2017 – 1623 to be exact – and is responsible for an irreplaceable 134,608 direct and indirect jobs. That number equals a staggering 15.08 percent of Alabama’s total wage and salaried employees. This also leads to more huge top-line numbers, including the Port’s annual economic impact of $22.4 billion and their yearly generated tax revenue of $486.9 million. Now, let me preface this again. I knew, probably more than most, that coal played a huge part in the Port’s business. I have been to an Alabama surface mine and greatly appreciate the tremendous economic impact the coal industry has on the Yellowhammer State. But I learned something new in a big way. Coal accounts for fifty percent – yes, half – of the Port’s total business. Needless to say, the “War on Coal” was a huge hit to the Port and to Alabama. For example, once serving seven steam (energy-producing) coal plants, the Port now only serves two. But there has been an improvement after President Obama left office, with conditions and optimism considerably and rightfully higher in the industry. The Port even saw a nine percent volume increase in coal transit last year. For the Port, a large part of their recent boon has been the emergence of Warrior Met Coal – now the Port’s single biggest customer by far. Warrior Met mines metallurgical (met) coal used to produce coke, which is pivotal in steelmaking and has been on a tear since it bought the high-quality mines left untapped by Walter Energy’s 2016 bankruptcy. Trading on the New York Stock Exchange (HCC), the Alabama company is excited about the good market outlook for met coal exporting, which also spells more good news for the Port. Of the 14 million tons of coal mined in the state last year, Warrior Met accounted for 7.5 million – well over fifty percent. At the end of the briefing, Deputy Director Thorne said that the surging economic conditions, for the Port especially led by strong outlooks for the Alabama met coal and steel industries, meant that they anticipated 2018 to show another year of double-digit percentage growth. It was on that note of optimism that we embarked from the unassuming office to tour the McDuffie Coal Terminal itself. Stepping outside the narrow office doors, you look around and can not help but see coal and containers. They each rise high – cities of containers, plateaus of coal towering as far as the eye can wander. We got back on the shuttle bus, headed eventually to hop aboard a tugboat. On the first attempt to get there, we ran into a train stopped on an intersection we needed to get to. The driver of the Great Southern Wood truck in front of us might not have been too pleased, but the train being at a standstill was actually a good thing, a sign of the rising economic tide, as it had stopped to take double its normal load due to an uptick in business. We turned around and circled to the other side of McDuffie. As I first noticed when we had arrived, there were puddles everywhere – which was strange since it had not rained that day or the day previous. But it finally struck me as we drove by a sign that read “15 mph … think dust.” The Port is so dusty – think thousands of acres of dirt – that they have to water the barren ground just to stop it from kicking up into workers’ and drivers’ faces. It was explained to us shortly after that the Port uses their own drainage water on the roads and shoulders to control the dust – another simple but cost-saving innovation. When we arrived at the Parker Towing vessel to go out on the water, I could feel the teeming energy of the place building – the train cars rumbling, the salt air blowing softly and the peaceful ebb of the water making the buzzing optimism of the place come alive. Everything about the place was striking – even the simple contrast of little white birds flittering about on the jet-black masses of coal. We boarded after a safety lesson and donning vests, out onto the water to see where the hard work happens. It was a confluence of characters, all who make the Port’s success possible, that made the tour so meaningful. Besides the ever-so-important and equally under-appreciated Port employees, you had the Parker Towing employees, who are top-notch operators of barges and waterway freight up and down Alabama’s waterways; Warrior Met employees, many of whom have been in the coal industry for a lifetime and came over from Walter Energy or other companies that did not survive the Obama Administration; Alabama Department of Labor Secretary Fitzgerald Washington, who is helping lead Gov. Ivey’s historic employment successes; and public officials, including incoming state legislators Chris Elliot and Shane Stringer and Rep. David Sessions, who will be transitioning into the state Senate this coming term. The Port is the lifeblood of Alabama, and the coal industry is largely the driver of this status – again, think fifty percent of the Port’s business. To experience first-hand what goes into making this possible was rewarding. 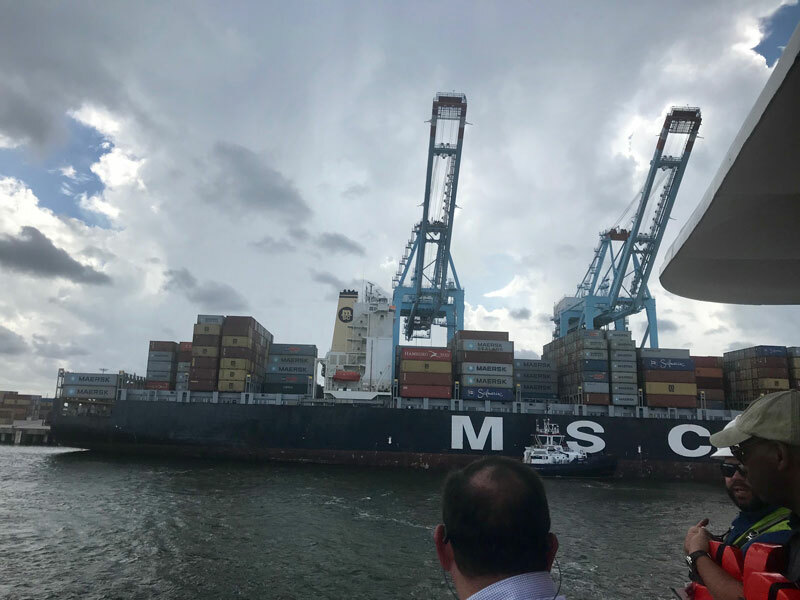 But to see Alabama’s congressional delegation cross the normal partisan lines this week to ensure the Port’s future competitiveness was historic. As the proposed plan for its expansion moves forward in the approval process, remember the real impact the Port has. Not only the dollars and cents, but the people – again, 134,608 jobs. If you take into account the average Alabama household size, this equates to over 340,000 people that rely on the Port of Mobile for their livelihood. Without the coal industry, this number would not be nearly as large. So, when you hear a politician say that only a handful of counties have mines and are affected by the industry, just know the real facts. From Sand Mountain through the Birmingham metro area even into the Black Belt and down to the Gulf Coast, coal is still king in Alabama.